The film noir classic The Big Sleep is now available in a stunning Blu-ray release from the Warner Archive. Boasting superb picture and sound, it also includes the full pre-release version of the film (in standard definition). General Sternwood has called upon Marlowe because he received several promissory notes, worth thousands of dollars, which Carmen signed over to Arthur Gwynn Geiger, a rare book dealer in Los Angeles. The promissory notes are alleged to be gambling debts. “Carmen,” says Sternwood, “is still a child who likes to pull the wings off flies.” But he doesn’t believe that the money owed represents real gambling debts, and he wants Marlowe to “get rid of” Geiger. While on his way out Marlowe is told by the butler that Vivian Rutledge (Lauren Bacall), Sternwood’s divorced older daughter, wants to speak with him. She pretends that she knows why her father asked to see Marlowe, who realizes that she is fishing for information and deflects her questions. She then lets on that she believes that Marlowe has been hired to find Shawn Regan, a friend of Sternwood who disappeared a month earlier. Marlowe then says that he wasn’t hired to search for Regan, but Mrs. Rutledge (as the detective insists on calling her) doesn’t know whether to believe him. He walks out, leaving her frustrated and annoyed. Marlowe does some research on antiquarian books and proceeds to Geiger’s book shop, where he pretends to be searching for two rare titles. He gets into a somewhat heated exchange with Geiger’s clerk, Agnes Lowzier (Sonia Darrin). When Marlowe asks to speak with Geiger she claims that he isn’t in, but the detective doesn’t believe her. He then visits a bookstore across the street and asks the lovely owner (Dorothy Malone) to describe Geiger. She gladly complies, and after giving Marlowe a detailed description of Geiger she closes her store, takes off her glasses and shares drinks (and who knows what else) with her visitor. When Geiger is picked up by his driver an hour later, Marlowe follows him home. Parking a short distance from Geiger’s home, Marlowe watches the house from his car. Another vehicle then drives up and parks. A woman gets out and enters the house. Marlowe walks over to the car and checks the registration, and it turns out that it is owned by Carmen Sternwood. He returns to his car and relaxes with a cigarette until he hears a scream and two shots ring out from Geiger’s home. Thus begins a twisting tale of violence, deception, blackmail, and spurned love. The witty screenplay by William Faulkner, Leigh Brackett, and Jules Furthman takes some liberties with Raymond Chandler’s novel, but it sparkles. Howard Hawks had, just a year earlier, directed Bogart and Bacall in To Have and Have Not, and once again he lets their obvious chemistry infuse all of their scenes together. The excellent cinematography is by Sid Hickox, who also was the cinematographer of To Have and Have Not. Bogart and Bacall are perfectly matched, and they have excellent support from Martha Vickers as Carmen, as well as John Ridgely as a gambler and Bob Steele as the gambler’s muscle. As noted, The Big Sleep has a convoluted plot – so convoluted, in fact, that the screenwriters couldn’t figure out who the killer is of one murder victim. As the story goes, they asked Raymond Chandler who did the crime and he responded that he didn’t know! Fortunately, this Blu-ray is so good that viewers will want to watch it multiple times, and each time the story comes a bit more into focus. What can one say about this picture quality of this superb Blu-ray which hasn’t been said about the previous Blu-rays which have been released by the Warner Archive? It is wonderfully detailed, with film grain intact but never obtrusive, inky black levels and excellent shadow detail, and not a hint of film damage to be found. The DTS HD-MA 2.0 English soundtrack is flawless. Every word of dialogue is clear and understandable, with no age-related noise or other anomalies to distract the viewer. The available Dolby Digital foreign language soundtracks are French, German, Spanish (Latin), Spanish (Castilian), and Polish. Subtitles are available in English SDH, French, German, Spanish (Castilian), Spanish (Latin), and Polish. The music is by Max Steiner and it is given a very pleasing soundstage. The big news in the extras department is the inclusion, for the first time, of the original 1945 cut of The Big Sleep which was never released theatrically but apparently was shown to the Armed Forces. Robert Gitt of the UCLA Film and Television Archive is on hand to explain why one scene was cut completely and reshot in an entirely different location, another was dropped altogether, and others were altered. A comparison of the two versions, also narrated by Gitt, was available previously, but now you can double your pleasure by watching both complete versions. Bacall shines more brightly in the theatrical release, but the story unfolds a bit more clearly in the original cut. Although it is in standard definition, the original cut still looks very good. The inclusion of the original cut alone earns this Blu-ray release five stars for extras, but the film’s theatrical re-release trailer also looks very good, albeit with some minor speckling. The Big Sleep is truly classic film noir and this gorgeous Blu-ray belongs in the collection of every serious film aficionado. It can be found at the Warner Archive website or at Amazon. richard-gallagher has published a new article. 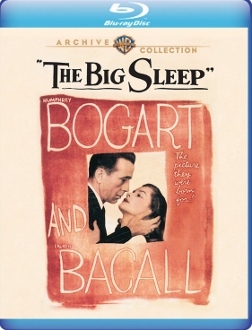 Good review, but this disc is not the first time the original cut of The Big Sleep has been included. It was on the DVD but not on the European DVDs. Thanks, I see that now. On the original DVD package there is a box which lists the special features, and it lists the comparison documentary but not the full cut, so I was under the impression that the full cut was not included. I am late to the party, but I just got around to watching the Blu-ray of this tonight, and it is a stunning transfer. Not a speck of dust or a bit of damage. I might prefer the transfer of The Maltese Falcon just a tad more, but it's certainly a photo finish along with Key Largo which was also a stunning transfer. These Warner Archive Blu-rays are such a gift to film lovers.